When you engage, your device springs to life, emitting sounds and enveloping people around you in the experience. 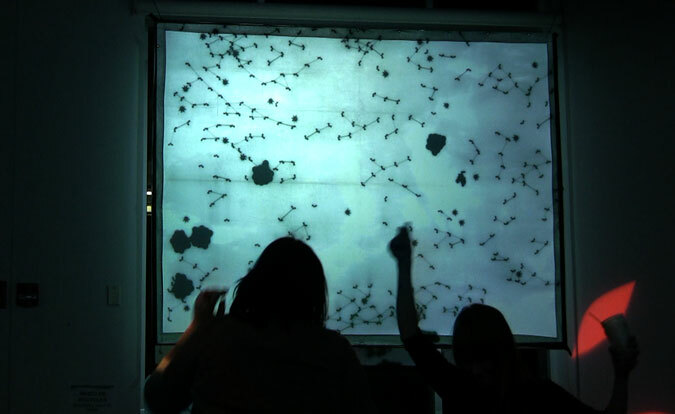 Players and non-players become acutely aware that the creatures on the large screen represent participants who are in the crowd around them. What's the idea behind Tentacles? Large public displays are transforming our world. Moving images, animated text and videos are everywhere: on elevators, train platforms and roadside billboards. The artistic team behind Tentacles set out to create an ambient play environment in this public space. It was intended to be always on – something to be discovered within the city. Without a beginning or an end, participants could join in or leave casually. From within the crowd, viewers can step onto the stage of the projected environment – to display themselves in action, engaged with other virtual creatures. Movements and gestures become part of this spontaneous public performance. Like on a dance floor, where rules about decorum, engagement with strangers and physical contact are suspended.